VLC is a free and open source cross-platform multimedia player and framework that plays most multimedia files as well as DVDs, Audio CDs, VCDs, and various streaming protocols. It's one of the most popular media player available on the internet. It's simple, fast and one of the powerful media player. It plays almost everything such as MPEG-2, DivX, H.264, MKV, WebM, WMV, MP3 and many more. You can download and use it on any platform like Windows, Linux, Mac OS X, Unix, so overall it's an freeware with no spyware, no ads and no user tracking. In-spite of this VLC media player can also convert one media file into other media also file also. And if you want to stream any movie in your VLC player then you can do it easily without any issue. But as we know nothing is perfect, while using VLC media player some users face an issue that is "Building Font Cache Error" while trying to play any media file. It's a little frustrating issue as it takes a lot of time in building vlc font cache also sometime it can hang your VLC media player also. 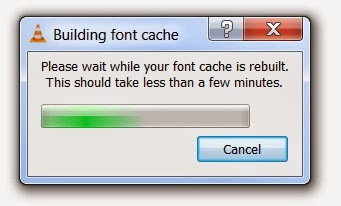 But don't to worry you can get rid from vlc building font cache error in just few clicks. Just follow the steps given below carefully in order to fix this error. Why I Am Facing Building Font Cache Error In VLC ? Most of users face this issue when they install VLC media player on their system for the first time. It happens almost every time when you first play VLC player with any file after its installation. While sometime this pop up is shown even after playing many files. The main reason is that VLC rebuilds font cache to show subtitles for your files which are shown at the bottom of file's screen while playing it. While some time you can face this issue due to old version of your VLC media player. So always be sure that your VLC media player is updated to latest version. Now go to Tools >> Preferences. You can use shortcut key Ctrl+P also in order to open Preferences. A new window will open, at the left side in the bottom you will see "Show Settings" with two options that is Simple and All. Switch from Simple Setting to All Setting. Now navigate to Video >> Subtitles/OSD and change the “Text rendering module” to “Dummy font rendering function”. Just click on Save button to make changes and restart your VLC media player and that's it. You will not face this problem again. So this was all about how to solve/fix building font cache error in VLC media player. If you have any doubt, query or another working method then feel free to mention it below in the comment section.